The word landscape is from the Dutch, landschap (the German cognate is Landschaft) meaning a sheaf, a patch of cultivated ground. The word entered the English vocabulary of the connoisseur in the late 17th century. Fine Art Landscape Paintings, Posters & Prints at Ace's Web World. 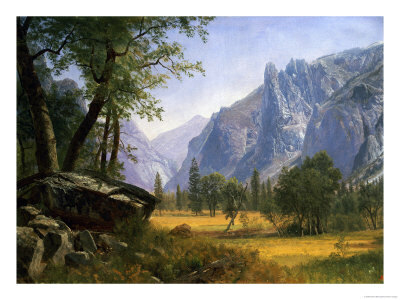 Available here are these art prints and posters of landscape paintings by the masters, among them Vincent Van Gogh, Frederic Church, Albert Bierstadt, John Rogers Cox, El Greco, Caspar Friedrich, JMW Turner, Piet Mondrian, Grant Wood, Maxfield Parish, Claude Monet, Hiroshige, Paul Cezanne, Willard Leroy Metcalf, Lawren S Harris, Thomas Cole, Jochen Fiedler, Benjamin Leader, Max Weber, Dennis Sheehan, AJ Casson, Paul Klee, FH Varley, Robert Zund, Edvard Munch, Carl Aagaard, Wolf Kahn, Paul Gauguin, Clyde Aspevig, Hokusai, Vanvitelli (Gaspar van Wittel) and Tom Thomson.